A county village has inspired West Worcestershire MP Harriett Baldwin to support an international initiative which promotes health and hygiene across Africa. Suckley village has been supporting a charity which twins toilets in Africa with their counterparts in the UK and currently is supporting 21 loos. Harriett, who is also Minister for Africa, was approached to support the scheme and agreed to twin a toilet in the Democratic Republic of Congo with a loo on at the Houses of Parliament. The charity works to promote toilet hygiene and to build more latrines. Harriett offered her support for the scheme and has also asked if the Houses of Parliament are able to support the scheme by twinning other toilets in Westminster. Harriett said: “I first learned of the importance of schemes such as this when I visited Africa with Save the Children and saw the work being carried out to build toilets and educate people about the importance of toilet hygiene. “I was impressed that so many villagers in Suckley support Toilet Twinning and have joined them by supporting a toilet in the Democratic of Congo. 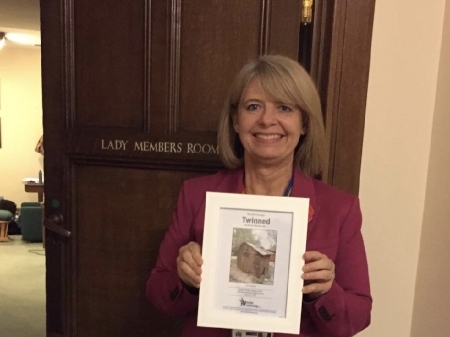 “This is an important initiative and I am happy to help spread the word by twinning one of our own Lady Members’ toilets near to my office at the Houses of Parliament as well as putting the certificate up on the wall to try to encourage my colleagues to consider joining this scheme.